FEMAS was created to provide tools for engineers to assist in PCB and system design. Our tools are based on full wave solutions to Maxwell's equations but operate much faster than traditional CEM tools. This suite of tools contains a number of tools to allow various analysis. The user interface is straightforward and easy to use. This tool allows you to read S parameter files and check both causality and passivity. Individual S parameters can be checked, or all S parameters within a file. Any S parameters that are not causal or passive can be displayed to show the frequency range where the error occurs. Causality and passivity can also be enforced if desired and the resulting S parameters saved in a new file. If multiple S parameter files are to be cascaded together, then this tool will allow users to combine all required S parameter files into a single S parameter file, and then Causality & Passivity can be checked and/or enforced. The FEMAS 2D Cross section (2DXS) analysis tool is an extremely powerful, yet inexpensive and easy to use tool to find impedance, coupling, and sparameters for various printed circuit board (PCB) and cable cross sections. Metal and dielectrics can be specified and even lossy materials used for this analysis. RGLC matrices can be found as a function of frequency, converted to S-parameters and seamlessly integrated with other FEMAS tools. 2DXS uses an automatic mesh generator and a powerful finite element solver to find the solution to either the standard cross sections or any user defined cross section. Users can view and refine the mesh if desired, or allow the automated meshing to proceed without user interaction. In addition to the RGLC and Sparameter outputs, users can view many different types of results, including electric and magnetic fields, characteristic impedance and many other parameters. 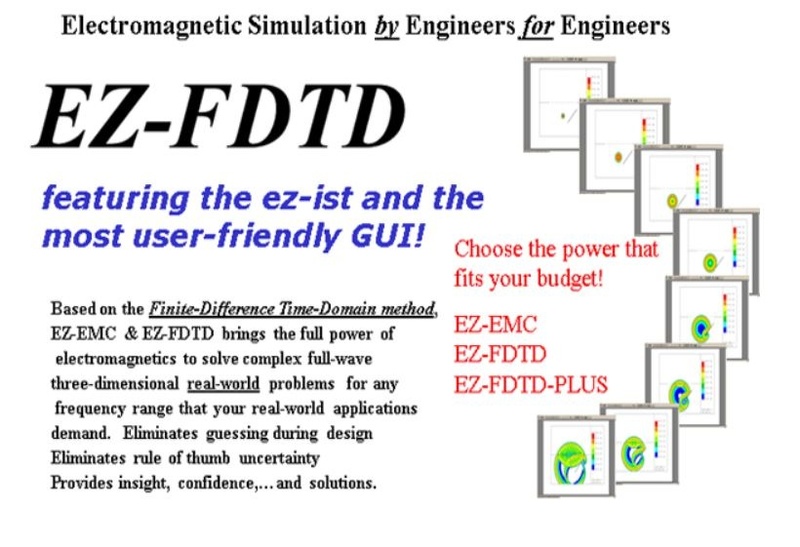 Based on the Finite-Difference Time-Domain method, EZ-FDTD brings the full power of electromagnetics to solve complex EMI/EMC real-world problems for any frequency ranges that your application demands. Eliminate guessing for critical problems. Eliminates rule of thumb uncertainty. Provides insight, confidence and solutions. Now released is EZ-FDTD version 2.2 for advanced FDTD modeling and simulation! Now released is EZ-FDTD+ for expert users needing special FDTD features!